I know many of you people are considering a trip to Cuba, especially since it is an extraordinary destination for photography. Here is another article relating to traveling in Cuba, covering this time the casas particulares, a cheap and exceptional way to lodge while discovering the country. They are cheap : The price of a night at a Casa particular is the equivalent of US$25 a night. We paid this amount in all four guest houses we visited. Some might be slightly more expensive, some might be cheaper. I would nevertheless be wary of very cheap options (as lows as US $10), as it will inevitably have a consequence on your level of comfort. Note that it is substantially cheaper than residing in hotels which start at about US $50. Moreover low end hotels are mostly state run which basically means lousy service and old infrastructure. For foreign operated hotels (mainly Spanish and French), expect prices starting at a minimum of US $75 per night. You get to sleep in a colonial house : Many casas particulares are actually old colonial houses with their typical high ceiling, columns, wooden furniture and terraces. What better way to sleep in a piece of history of the country? 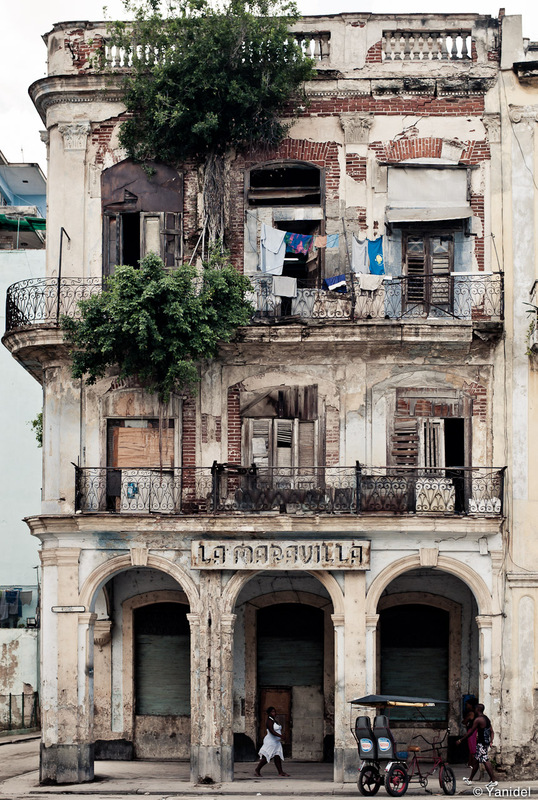 Many colonial houses in Cuba are in a bad shape, yet the ones that get the Casa Particular logo (a blue sign on the front door with the word “divisa”) are all renovated. The Marvel ;) Though not renovated, this is how a typical colonial house looks like. 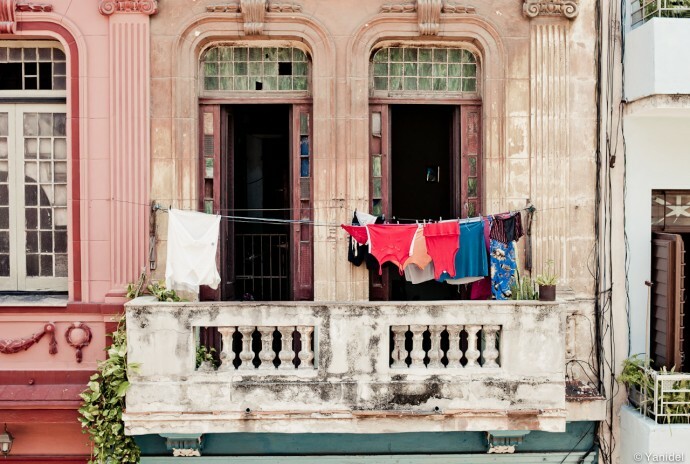 You interact with Cuban : Since these are private houses, you actually reside in someone’s house. Meaning that you share their life for a couple of days and get to interact with them a lot (speaking Spanish makes it obviously easier). We met great people during our stays, not only the owners but other travelers. While you can’t talk about any subjects the minute you arrive, Cubans will open up quickly and it give way to great discussions. I remember a starry night in Cienfuegos where we talked a long time with the owner on top the house, after having eaten a delicious lobster. Hotels can’t provide you with this type of experiences. Luis who hosted us in Trinidad. Can you find more Cuban ? Food is excellent : Every casa particular provides a range of options for those willing to eat there. The meals proposed are all home made, typical Cuban and of great quality. 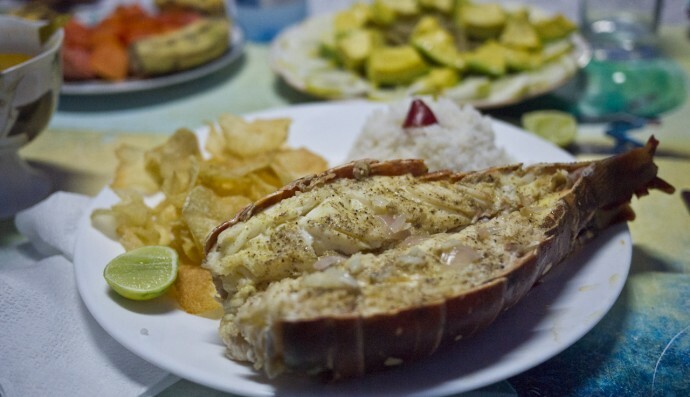 Prices range from US $3 for a full breakfast to US $10 for a full meal and lobster. Needless to say this is much less expensive than what you will find in the street. We really enjoyed these meals, sometimes shared with other guests. Breakfasts had a lot fruits and dinners full of fresh seafood. Service at his best : Since the casas particulares are private, the owners have to provide excellent service for their business to strive. They are usually allowed to have only 2 rooms per house, meaning that you won’t be just one customer among dozens. Therefore, they’ll make sure that your stay is as great as possible and will recommend them afterwards. Moreover, many of them are listed on internet hostel websites, so their reputation is highly dependent on the customer reviews they’ll receive afterwards from their guests. Finally, Cubans being the Kings of finding solutions to anything, they’ll gladly help you out in all of your requests, be it a cab, a phone call, or making a reservation for the next stage of your itinerary on the island. How to proceed ? If you do plan to stay at a casa particular, I recommend to only book the first casa particular on your itinerary. To do so, book a casa particular through the internet with a high rating and excellent customer reviews. Once there, the owners will make all the ensuing bookings for you in their network of guest houses . Indeed, this warrants you that you’ll find an equivalent level of service and accommodation in further stops as the first casa particular is not going to risk its reputation on a bad experience you might have somewhere else. We used the following website to do our first booking in Havana. The offering is extensive and you can check availability live. A 10% deposit is required to make a reservation. 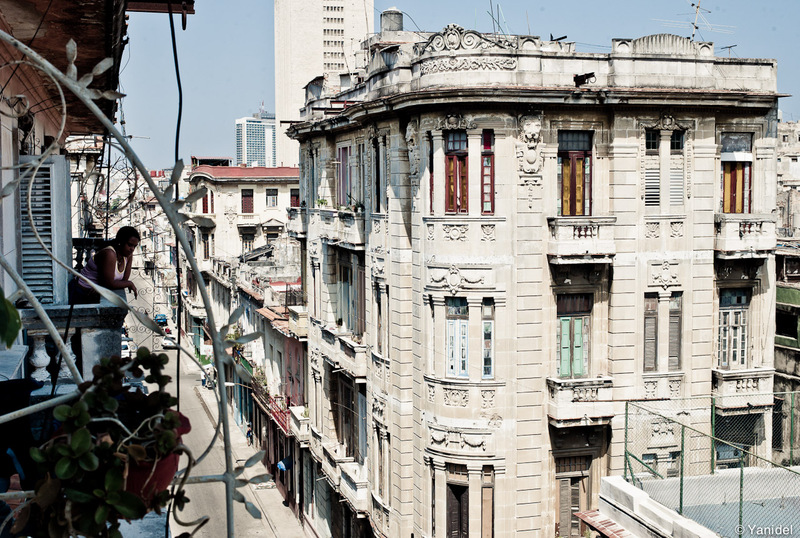 On this website, you’ll find the casa particular we resided in Havana. They were great people and made all the further bookings for us on the Island (Cienfuegos, Trinidad, Santiago). Our trip went perfectly so I can only highly recommend them. Their Colonial house is located in Old Havana and is three block from the Malecon. You’ll find youself right in the heart of daily life in Cuba. And this is for sure the best way to discover the country. A view from Leo’s house in Havana. We stayed there one night when Casa Miriam was full on our way back. To avoid/tips : Some travelers prefer to head to a destination and find a guest house when they arrive. In most cities, there will be a herd of people waiting for the arrival of the bus and will jump on you to propose their rooms. While there are surely a lot of honest people among them, you have absolutely not guarantee on the owners of the house nor the quality of the room. I have heard account of tourists having some of their bags stolen at private houses. Though I am sure it is not a widespread habit, avoid yourself the risk and book something before. Another scam is people waiting for you in front of a casa particular and directing you to another one when you arrive. They’ll explain that the owner’s just suffered a death in the family and had to lodge you at a familiar’s house. You’ll be therefore taken to another private house that will result completely unconnected to the one you booked. It can happen with taxi drivers too, if asked where you are going, just give the direction and say it is a friend’s house. Otherwise, they might very well drop you off at another house. Finally, some casas particulares are sometimes full so you might be relocated to another one belonging to the same network. It is ok, but you might end up in one that is not a colonial house. At least you get the guarantee of a similar level of service yet if you absolutely want to reside only in colonial houses, specify it clearly to the person making the booking in your next destination. 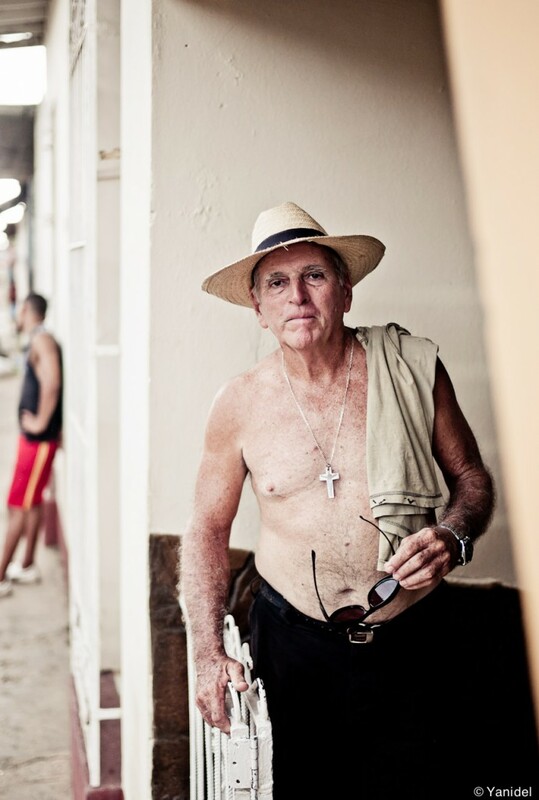 As a final word, Cuba is not only about how it looks, but also about its people. They best way to find out about it is to share part of their daily life. Leave hotels for your next stay in Cancun, Cuba must be experimented with Cubans. Me encanta La Maravilla!!!!!! Preciosa foto Yanick!! Really enjoying these articles Yanick. I’m bookmarking them as they come along. Glad you like them, I’ll have a few other ones coming. Superb inftamroion here, ol’e chap; keep burning the midnight oil. Can you help to get a reelable secure honest Casa particular…? of content ѕo people could connect witһ it better. Youve got аn awful lot of text fօr only ɦaving one ⲟr two images. MaуƄe you coᥙld space it ߋut Ƅetter?